Did you know that you can create personalized Coke bottles with the names of your friends and family on it? Anything that can be customized is fantastic in our books! In honor of sharing a coke with your friends and family and spreading a little more happiness in the world, our friends at Coca-Cola are hosting a #ShareaCokeContest. Where one winner will be gifted a chance to win $1700 in prizes! Including 2 United Airlines ROUND TRIP TICKETS and a $500 Visa gift card. A perfect opportunity to share a special moment this summer with someone — whether that be an out-of-town wedding for a friend or special trip with a loved one like a honeymoon wink wink. Read on to see how you can win! 1. 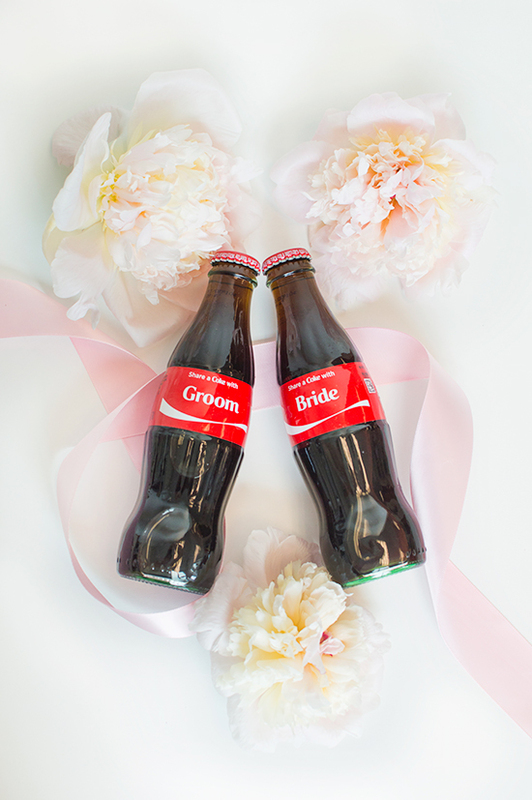 Visit out our Share a Coke Pinterest board here. 2. Repin your favorite image to one of YOUR Pinterest boards. 4. 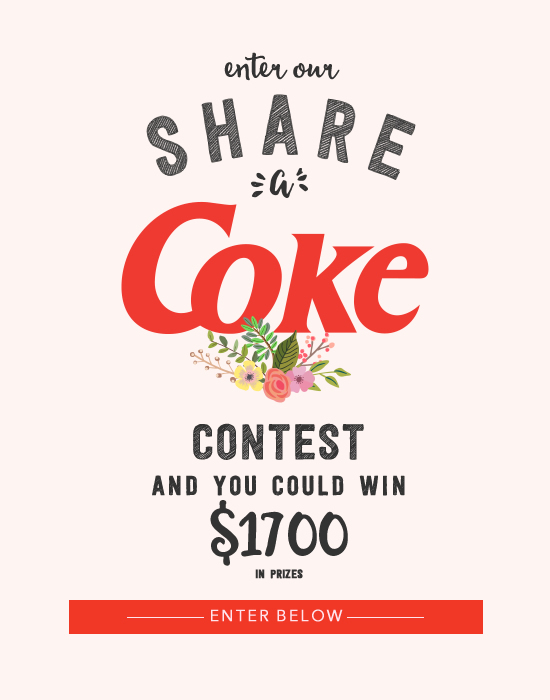 Winner will be announced August 3, 2015 on our Facebook Page Here Please Note: You do not need to feature Coca-Cola as your #ShareaCokeContest in order to be entered to win. Click the Read more button for further details. Thank you for entering the winner will be August 3, 2015 on our Facebook Page Here ENTRANTS: Only one entry per authorized account. Entries will be deemed to have been submitted by the authorized account holder of the Pinterest account submitted at the time of entry. "Authorized Account Holder" is defined as the natural person who is assigned to a Pinterest account by Pinterest. Only one entry per authorized account holder is allowed. All entries must be received by the end of the Contest period in order to participate.CONTEST PERIOD: Contest starts at the time this post is published. The contest ends midnight Pacific Standard Time (PST) on August 1, 2015.WINNER SELECTION: At the end of the Contest period, one (1) grand prize winner will be chosen by Wedding Chicks as the “Grand Prize Winner”. This Contest is a game of chance and skill plays no part in it.WINNER NOTIFICATION: The potential winner will be notified by e-mail using the contact information provided at the time of entry. If, despite reasonable efforts, potential winners do not respond within twenty-four (24) hours of the first notification attempt, such potential winner will forfeit his or her prize. If any potential winners are found to be ineligible, or if he or she has not complied with these Official Rules or declines a prize for any reason prior to award, such potential winner will be disqualified and an alternate potential winner may be selected. Contest Sponsors is not responsible for any incorrect or illegible address information or the non-delivery of any prize resulting therefrom, or for any unsuccessful efforts to notify a winner.PRIZES: The grand prize winner will receive one (1) Coca-Cola + United Airlines “Share a Coke” prize ($1,700 Approximate Retail Value per prize pack).ODDS OF WINNING: No purchase of any kind is necessary in order to enter the Contest or win any prize, and chances of winning are not enhanced by making any purchases. Sponsors make no warranties, and hereby disclaim any and all warranties, express or implied, concerning any prize furnished in connection with the Sweepstakes. WITHOUT LIMITING THE GENERALITY OF THE FOREGOING, SUCH PRIZES ARE PROVIDED “AS IS” WITHOUT WARRANTY OF ANY KIND, EITHER EXPRESS OR IMPLIED, AND Sponsors HEREBY DISCLAIMS ALL SUCH WARRANTIES, INCLUDING BUT NOT LIMITED TO, THE IMPLIED WARRANTIES OF MERCHANTABILITY, FITNESS FOR A PARTICULAR PURPOSE AND/OR NON-INFRINGEMENT.This prize was provided by The Coca-Cola Company. The Coca-Cola Company is not a sponsor, administrator or connected in any other way with this promotion.